Transport Sec Patrick McLoughlin tells #wato "80% of cyclists hold a driving licence so not right to say motorists & cyclists separate"
The mood music starts to change: government starts making baby steps in messaging that bicycle transport is a good thing. Last week, something quite strange happened. Amid the press noise about an additional £77million to fund cycle infrastructure in a handful of cities and national parks, the government issued a detailed briefing note about its 'ambition for cycling'. Lurking in the detail of that note two things stand out. For the first time that I can recall, the UK government stated that it supports the idea of creating infrastructure that is specifically for cycling. 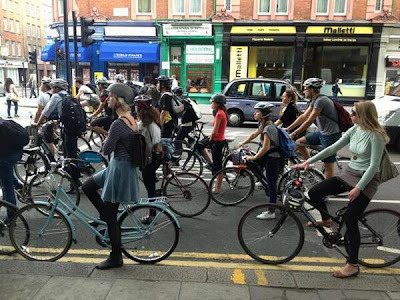 It marked this by saying that investment in cycling will help "motorists – by reducing congestion and conflict as a result of the careful segregation of traffic". Just listen to those words again: "careful segregation of [bicycle and motor] traffic" (I've added the bit about bicycle and motor). Now read what the Dutch road safety institute says about creating safe conditions for cycling: "The ultimate solution for the blind spot problem is a structural separation of trucks and cyclists." The Dutch have been saying for years that we need to create separate traffic flows for bike and motorised traffic. This is the first time I've heard the UK government state anything even close to the Dutch perspective and I think it marks a turning point. London rush hour (pic via ITV News). Just along the road from here, cyclists (who make up over 60% of the traffic rush hour) are banned from the bus lane and diverted via a lethal 5-lane gyratory, scene of yet another cyclist death early this month. Not good enough, Camden council. There are a number of other indicators of a shift in tone from government in that report. The document states clearly that cycling is good for business "[it] improves access to employment sites, local shops and leisure facilities". This sort of language might not sound radical to people who read this blog but, again, you don't have to look far to see countless examples of government NOT saying this sort of thing. What also stands out to me is the fact that for the first time, the idea of 'bicycle = transport' seems to be starting to permeate mainstream Westminster thinking. And that's not all. A couple of years ago, mainstream professional organisations seemed to think that bicycle transport would just happen by people making 'smarter travel choices' (whatever that means), some of them are coming round to the idea that there is a genuine need to invest in bicycle infrastructure. The Chartered Institution of Highways & Transportation, for example, states that it "supports the development of programmes that integrate investment in both high quality infrastructure and smarter choices". That's important because we need support for proper infrastructure to take hold. Tower Hamlets clearly thinks this is good cycle infrastructure. It's not, it's dreadful; and an utter waste of taxpayer money. But we could see more of this without decent design standards. What we also need, however, is robust criticism of the government's plans. And it's very encouraging to see some mature criticism around cycling policy emerging at a political level and within the sorts of professional and trade bodies that we're going to need to deliver some of this change. The Chartered Institution, for example, notes that total shambles of bicycle design standards. London still doesn't have its own cycle design standards (technically it does but they've hardly ever been applied, more details here) and yet some boroughs are already busily designing their own. Southwark council, for example, has just released its draft standards which are pretty patchy. What this means is that there is a significant risk London will end up with 36 different sets of bicycle infrastructure design standards. That will mean cycle ways that look and feel completely different from one borough to the next. That's not acceptable when we design roads for motor traffic so why should it be acceptable for bicycle traffic? It's also very interesting to see that it's no longer just the bloggers who are pointing out one undeniable fact about the government's cycling investment: People are starting to notice that the amount of money being invested is peanuts. What's more, the manner in which investment for cycling is being provided is really not encouraging. The Chartered Institute notes that the amount of money being invested is hardly any more than was provided by Cycling England (a body that invested in cycling infrastructure in some UK cities and was dismantled by the government in its bonfire of the quangos) and it quotes the Cycling Embassy of Great Britain's excellent point that there is no continuity or security in any of this funding. That's important. If you look at some of routes on the existing London Cycle Network, you'll see that most of the routes have had zero investment ever since Boris Johnson came to power. The result is potholed roads, missing signposts, changes elsewhere on the road network that have rendered some of the cycle links completely useless. You need to invest and you need to sustain investment, not just do a bit here and there when it pleases you. I'm encouraged by the shift in the political language around cycling but I really feel that we're still stumbling around when it comes to meaningful investment in bicycle transport: bits of money here and there; design standards all over the place; no certainty of on-going investment and maintenance. The mood music is good but the delivery is unbelievably patchy. Perhaps there is room for a Churchill quote here - you know, the one about it not being the beginning of the end, rather the end of the beginning? "End of the beginning"??? Give me a break; this country has not even started. What we need is not words in reports or in the mouths of buffoons, but good quality work. Quoting Copenhagenize, "Paris, Seville et al didn't have a pompous announcement about cycling funding like the UK. They just started building infrastructure"
The UK is the laughing stock of Europe. That 80% stat of cyclists holding a driving licence is interesting as it could mean that in some London boroughs a higher percentage of cyclists hold licences than car drivers! I need to check this but think my memory is correct that a few years back during a joint police/DVLA etc exercise in Hackney 25% of motor vehicle drivers had no valid driving licence. Great post and in tandem with the recent Guardian bike blog post http://www.theguardian.com/environment/bike-blog/2013/aug/12/david-cameron-cycling-revolution-investment. There's been some quite +ve comments about Camden's changes to the Royal College Street cycling infrastructure, but it does highlight your point about "bits here and there". I have often thought that the 30-odd London boroughs could start moving in different directions in terms of their cycling plans, and it's starting to show a bit - how's Gilligan going to deal with this (I'm sure he _knows_ this, but it still need solving).